Social and emotional skills, self-discipline and behavioral functioning during childhood are major predictors of school success, which in turn affects economic well-being and higher education attainment in adulthood. And, certain early life experiences have significant impacts on the psychological, emotional, and behavioral health of children. In particular, research has demonstrated a profoundly negative impact on children whose fathers are incarcerated. According to a 2010 report released by the Pew Charitable Trust, there are 1.1 million fathers in jail who have children under the age of 17. This same report found that, 2.7 million children in the U.S. have one or both parents behind bars. A 2015 study by Anna Haskins of Cornell University examines the impact of paternal incarceration on children’s social and behavioral development by employing a somewhat rare method of analyzing self-reports by those children. The study used data from the Fragile Families and Child Wellbeing Study, which, starting in 1998, randomly sampled children at birth from hospitals in 20 large U.S. cities, and surveyed them and their families at ages 1, 3, 5 and 9 years. Because many of the factors that predict paternal incarceration also predict child social and behavioral functioning, the study used a matching design to control for these factors. Children whose fathers were incarcerated for the first time when they were between the ages of 1 and 9 were drawn from the study population, and assessed for socioeconomic, demographic, neighborhood, health, and parental behavior characteristics. Each child was then “matched” with a control child (whose father had never been incarcerated) with similar characteristics. Children whose fathers were incarcerated by or before the age of 1 year were not included in the study. 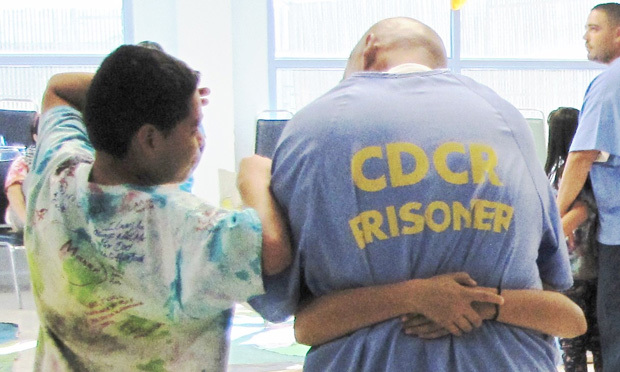 Nearly 46 percent of the fathers in the study were incarcerated by the time their child reached age 9. Paternal incarceration was associated with higher child-reported antisocial behaviors. Children’s prosocial development did not appear to be negatively impacted by paternal incarceration. However, the author cautions against the assumption that parental incarceration has no impact on this type of behavior. When children were divided by gender, paternal incarceration had a negative impact on boys’ social and behavioral functioning, but effects were not statistically significant for girls. Further Reading: A 2015 study in the DuBois Review gives national estimates of the number of people connected to prisoners as either friends, family or neighbors according to race and gender. A 2014 report in the Bureau of Justice Statistics details demographic and geographic trends in U.S. state and federal prison populations in 2013. A 2014 report by the American Psychological Association explores why the U.S. prison population is so high, and explains its ramifications.